Aerostar and San Juan Bay Estuary Program officials inspect the new exhibit unveiled Thursday. The Luis Muñoz Marín International Airport will inaugurate a second immigration and customs area below the first level of Terminal A — currently occupied by jetBlue — Aug. 18. The facility entailed a $4.8 million investment, this media outlet confirmed Thursday. The area will comprise 14 inspection lanes and will feature a new one-step passport review process established by U.S. Customs and Border Patrol, said Agustín Arellano, CEO of Aerostar Puerto Rico, operator of the airport. “The new international area will feature Automated Passport Control systems, and this airport will become the first in Latin America to have it,” Arellano said, noting the new immigration area will serve passengers coming from most of the islands in the Caribbean, except the U.S. Virgin Islands. Meanwhile, the LMM is one of 10 U.S. airports that is participating in tests of a new TSA bag-screening process for electronics, the Associated Press reported. The procedure entails removing electronic devices bigger than a mobile phone from bags and placed in separate bins so they can be inspected more closely, AP reported. The effort to “de-clutter baggage,” as the TSA said, seeks to stay ahead of security threats by inspecting items that can appear similar to explosives while going through the X-ray machine. Requiring travelers to spread their belongings among more bins could slow down the screening process. The AP reported that TSA said it is testing ways to make screening quicker and more targeted. 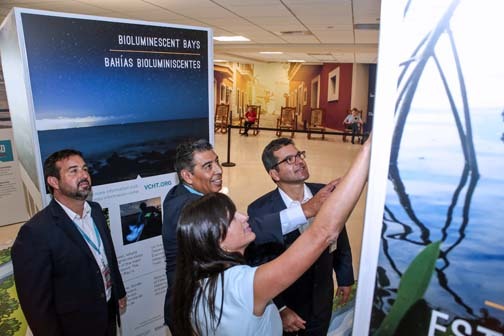 The airport executive confirmed the upcoming development after participating in a news conference to unveil a new exhibit and collaboration effort to improve and protect the San Juan Bay Estuary. Aerostar teamed up with the San Juan Bay Estuary Program to create the “San Juan Bay Estuary: Our Window to the World” exhibit inside Terminal B, which aims to educate the more than 3 million passengers that go through the airport in a year about some of Puerto Rico’s most impressive ecosystems. The exhibit will be up for about a year, said Brenda Torres-Barreto, executive director of the San Juan Bay Estuary Program, adding the effort entailed the collaboration of several environmental groups, namely Programa del Estuario, Proyecto Coquí, Proyecto Enlace, Sea Grant, the Vieques History and Conservation Trust, and Arrecifes Pro-Ciudad. “Our goal is to motivate citizen action for the care and conservation of these natural resources, through education, restoration projects and scientific studies,” she said of the exhibit that showcases professional photos of Puerto Rico’s most impressive natural resources. “We’re also promoting tourism in the area with a variety of activities the visitor can enjoy, such as water adventures or simply walking or bike riding while admiring the landscapes the ecosystem offers,” she said. “If we want to inject Tourism into an island surrounded by water, we have to protect our bodies of water and the environment. This is fundamental to be able to offer tourists more and better experiences in Puerto Rico,” Arellano said. Hey Buddy!, I found this information for you: "LMM to unveil new .8M customs area at Terminal A". Here is the website link: https://newsismybusiness.com/unveil-customs-terminal/. Thank you.